Lanzarote Restaurant, Playa Blanca Restaurant. Atlantico Bar Restaurant Playa Blanca, Lanzarote, Portuguese and International Cuisine , tasting flavours, with artistic presentation at affordable prices. We create our cuisine with personal style, using local and international ingredients and both ancient as well as modern culinary technique as its point of departure.Queries and Reservations : 0034 656973060. Restaurant Playa Blanca, Lanzarote. Comida para llevar in Lanzarote, reparto de comida con gran variedad de menús de los restaurantes que ofrecen Pizza, Kebabs, comida china, india, tailandesa, italiana, canaria, española y mucho más. Pida comida a domicilio de los mejores restaurantes en Lanzarote, entrega rápida a su casa u oficina. Il Nuevo Gelato <Icecream Parlour> . You can orde as well ; Soft drinks ,Wines,Spirits,Exclusive Porto Wines ,Cigarettes ,Ice ,24 / 7 ,Yeah 24 / 7 all day long and all night long.!!!! 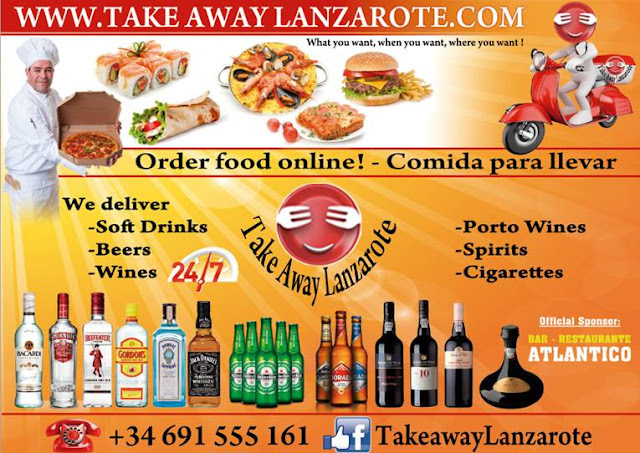 Order high-quality takeaway online from top restaurants in Lanzarote, fast delivery straight to your home or office .Get amazing food from an incredible selection of local restaurants . For more info visit the Takeaway Lanzarote or call 0034 691 555 161.